Theme Overview: Agriculture in a Turbulent Economy�A New Era of Instability? The Emergence of an Agro-Energy Sector: Is Agriculture Importing Instability from the Oil Sector? The World Economic Crisis and U.S. Agriculture: From Boom to Gloom? Are Our Agricultural Risk Management Tools Adequate for a New Era? The growth in U.S. ethanol production has been explosive. Excluding December, total U.S. production in 2008 was 199.6 million barrels which was a 43% percent increase over the previous year. Since 2000, output has grown by 460%, and since the passage of the Energy Policy Act of 2005, 130%. From 1981 to 2008, U.S. ethanol production has grown by more than ten times. Although ethanol can be produced from grain or cellulose-based feedstock, commercial ethanol production in the U.S. is mostly corn-based. Consequently, the growth in ethanol production has resulted in changes in corn usage. For instance, only 6% of U.S. corn production was used in energy production in 1990. By 2007, this increased to 23%. The use of corn in fuel production has resulted in price increases in the U.S. grain sector and is often cited as the cause of food price inflation in recent years. Needless to say, ethanol is not the sole culprit. Other factors, such as contractions in international grain supplies, increased food demand in developing countries, and the depreciation of the U.S. dollar have also played a role. However, the increase use of corn in energy production has led to greater integration between energy and agriculture where oil and corn prices appear to move in tandem. Soybean and wheat prices have also followed this same pattern. Given the industrialization and mechanization of U.S. agriculture, energy is an important resource used in production. Depending upon the intensity of energy use, economic theory suggests that higher real energy costs should decrease supply (holding other factors constant) which should lead to an increase in the price of agricultural commodities. Price inflation of this type is cost-push and depends upon energy use relative to other inputs and resources. With the expansion of U.S. ethanol production, there has been a reversal of roles of sorts. Whereas in years prior, the primary relationship between energy and agriculture was the use of energy in agricultural production, in more recent years, agricultural commodities, particularly corn and soybeans, have become increasingly important as inputs in energy production. In this instance, oil price spikes not only increase the cost of agricultural production, but also increase demand for alterative fuels thereby increasing the demand for commodities used in producing alternative fuels. Consequently, not only is there cost-push price inflation, but there is also demand-pull price inflation in those commodity sectors important to alternative fuels production. In 2008, record high prices for corn, soybeans, and other food and feed grains, and record high oil prices occurred simultaneously. In addition, there has been a strong correlation between agricultural prices and oil prices in recent years. Given the observed interrelatedness between oil and agriculture, two questions arise. Is the agricultural sector importing price instability, or possibly stability, from the oil sector? Is the relationship between the oil and agriculture sectors temporary or permanent? No one can say with certainty that our recent experience marks a new era and the beginning of an Agro-Energy sector. This will only be known with the passage of time. As this article will confirm, however, the increase in U.S. ethanol production has resulted in a stronger relationship between oil and agriculture, particularly since the passage of the Energy Policy Act of 2005. The substantial rise in oil prices is often cited as the cause of the increase in U.S. ethanol production. However, energy policy has also played an important role in expanding both production and demand for biofuels. Key legislation includes the banning of Methyl Tertiary-butyl Ether (MTBE) as a gasoline oxygenate and the Renewable Fuel Standard (RFS) of the Energy Policy Act of 2005. In addition, tax incentives contributed to the expansion of the alternative fuels industry. The Energy Policy Act of 2005 amended the Clean Air Act and established a National Renewable Fuel Standard (NRFS) program to ensure that, beginning in 2007, gasoline sold in the United States contains a minimum volume of renewable fuel (USEPA, 2006). The NRFS program from 2007 to 2012 sets forth a seven-year phase-in of renewable fuel volumes, beginning with 4 billion gallons in 2006 and reaching 7.5 billion gallons in 2012 (Renewable Fuel Association, 2007). This policy provides a subsidy in the form of a volumetric tax credit for ethanol blenders, credit for ethanol plants producing less than 60 million gallons per year, and an income tax deduction for fuel-flexible vehicles. In December 2007, President Bush signed into law the Energy Independence and Security Act of 2007 (EISA) which mandates renewable fuels production level until 2022. EISA requires the production of 12.95 billion gallons of renewable fuels by 2010 and 36 billion gallons by 2022. Beginning in 2015, however, corn based ethanol is capped at 15 billion gallons. Prior to 2005, there was little relationship between oil and corn prices (Figure 1). Empirical research shows that from 1990 through 2004, the relationship between oil and corn prices was statistically weak and that less than 2% of the change in corn prices could be explained by oil price movements. From 2005 to 2008, the relationship between oil and corn was more profound, over 60% of the change in corn prices was explained by oil prices. 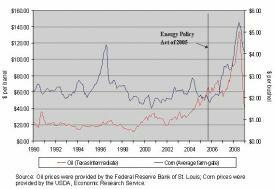 This relationship between oil and corn prices did not exist prior to the passage of the Energy Policy Act of 2005 and is likely due to the change in ethanol use. Prior to the Energy Policy Act, ethanol was mostly used as a gasoline oxygenate. Since the enactment of renewable fuel standards, ethanol is used more as fuel. From 2000 to 2005, U.S. ethanol production grew by over 140%, which is greater than the production growth from 2005 to 2008. During this period, the relationship between oil and corn did not appear to exist and, in 2004, corn and oil prices actually diverged where corn prices decreased while oil and energy prices increased. 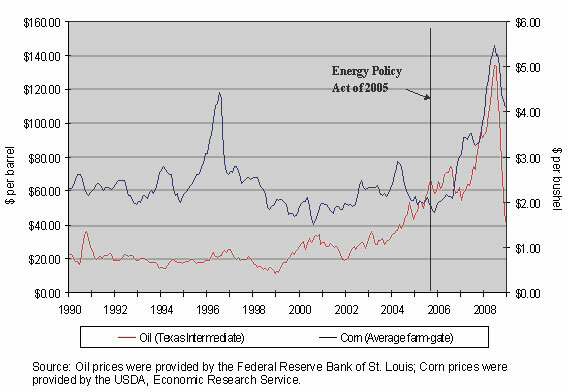 It was only with the passage of the Energy Policy Act of 2005 that the direct relationship between corn and oil prices emerged. Figure 1 is particularly revealing when considering if the relationship between agriculture and oil is temporary or structural. There has been a strong correlation between oil and corn prices since 2005 when both prices were rising (corn and oil prices even peaked around the same time). The substantial fall in oil prices in late 2008, however, did not produce an equally substantial fall in U.S. corn prices. Thus, the relationship between corn and oil may be less profound when oil prices decrease. The relationship between corn and other agricultural commodities such as soybeans, wheat, beef, and poultry is due to several factors on both the supply and demand side of the agricultural sector. On the supply side, corn competes with other crops for acreage and livestock for pasture. For instance, from 2006 to 2007, corn acreage increased from 80 to nearly 95 million acres, while soybean acres decreased from 75 to 65 million. With increased corn demand, less acreage is allocated to other crops and grazing, resulting in higher commodity prices in those sectors with significantly reduced acreage (holding other factors constant). On the demand side there is the competition between corn and other crops as inputs in food and feed manufacturing. In this instance, an increase in corn prices increases the demand for competing inputs in food and feed manufacturing, thereby increasing their prices. There is also the use of corn as feed where higher corn prices results in higher livestock production costs and a decrease in the supply of livestock products. Holding other factors constant, livestock product prices should increase. 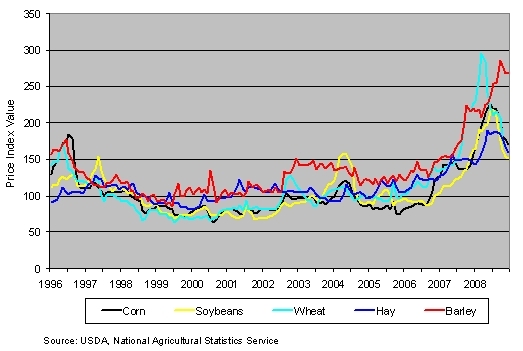 Price indexes for corn, soybeans, wheat, hay and barley from 1996 to 2008 are shown in Figure 2. As with corn, significant price increases occurred for these crops since 2005. 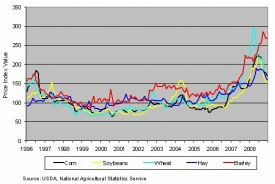 From January 2006 to peak prices in 2008, corn prices increased by 174%, soybean prices by 125%, wheat prices by 190%, hay prices by 70% and barley prices by 137%. As noted at the outset, these price increases were not solely due to the growth in ethanol production. Studies have considered the role that ethanol has played in causing agricultural price inflation. Results suggest that only a percentage of these price increases are attributable to ethanol. Given the importance of corn as livestock feed in the United States, a rise in corn prices increases the cost of feeding livestock, which leads to an increase in livestock product prices. 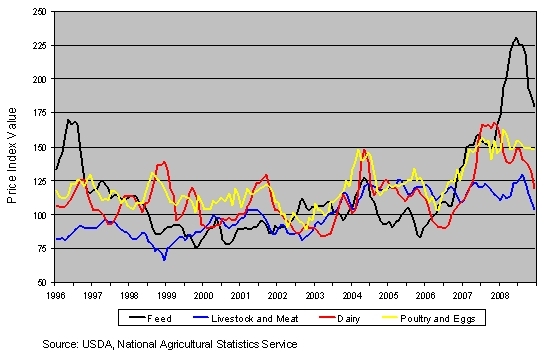 To compare the relationship between feed prices and the price of livestock products such as meat, dairy products and eggs, price indexes for feed and livestock products from 1996 to 2008 are shown in Figure 3. Since corn makes up a significant percentage of feed use in the United States, the increase in feed prices shown in Figure 3 reflects the increase in corn prices in Figure 1. Unlike crops prices, which significantly increased starting in 2005, this was not the case for all livestock products. Since 2005, livestock and meat prices remained relatively flat and started to fall in late 2008. Since 2005, feed prices have increased by 124% while livestock and meat prices increased by 14%, dairy prices by 81%, and poultry and egg prices by 48%. The rise in agricultural and food prices in recent years was not solely due to the increase in ethanol production. A number of studies have analyzed the factors than contributed to the rise in agricultural and food prices and found that the increase in ethanol production did not fully explain the price inflation witnessed in the last few years (Table 1). The U.S. Department of Energy (DOE) examined the causes of price spikes in the corn and soybean markets, and the retail food sector. International food price inflation was also analyzed. It was found that during the period May 2006 to June 2007, only 23% of the changes in U.S. corn and soybean prices could be attributed to the biofuel sector. However, from June 2007 to July 2008, 54% of corn and 49% of soybean price changes during this period was due to the growth of the biofuels sector. In terms of retail food prices, only 3 to 4% of the rise in retail food prices in 2007 was due to biofuels. In examining the effects of biofuels on international prices from April 2007 to April 2008, it was found that only 23% of the rise in international corn prices was due to biofuels and 31% of the rise in international soybean prices was due to biofuels. Also, only 10% of the rise in international food prices was due to biofuels. Similar results were found in other studies where the impact of increased biofuels production was greatest in the corn and soybean sectors. In regards to related agricultural crops, Rosegrant (2008) found that 22% of the rise in wheat prices from 2000 to 2008 was due to biofuels production. With the enactment of the Energy Policy Act of 2005, a strong relationship between corn and oil emerged. Those agricultural products related to corn were also affected. Because the livestock sector did not experience price inflation of similar magnitude and faced higher feed costs, producers’ profit margins were negatively affected. While the future relationship between oil and agriculture is uncertain, the ethanol-induced increase in corn demand resulted in an oil/agriculture linkage that had not been seen in prior years. With high energy prices and relatively low corn prices in 2004, ethanol production was an attractive investment. Ethanol was even more attractive given the government incentives and tax credits as well as the renewable fuels mandates which basically guaranteed increased demand in the future. Now that oil prices have fallen, should we expect a sustained relationship between oil and agriculture? The renewable fuels mandate has created a “floor” under ethanol use in the United States and possibly a floor on corn prices. This could explain why the correlation between and oil and corn prices was stronger when oil prices were increasing. Fortenbery, R., and Park, H. (2008). The Effect of Ethanol Production on the U.S. National Corn Price (staff paper no. 523). University of Wisconsin-Madison Department of Agricultural and Applied Economic. Available on line: http://www.aae.wisc.edu/pubs/sps/pdf/stpap523.pdf. Hasing, T., Zapata, S., and Carpio, C.E. (2009). Effect of Biofuel Expansion on Commodity and Food Prices. Presented at the Southern Agricultural Economics Association Annual Meeting ‘09, Atlanta, Georgia. Renewable Fuel Association. (2007). From Niche to Nation, Ethanol Industry Outlook 2006. Available on line: http://www.ethanolrfa.org/industry/outlook/. Rosegrant, M. (2008). Biofuels and Grain Prices: Impacts and Policy Responses. Testimony for the U.S. Senate Committee on Homeland Security and Governmental Affairs. Washington, DC: International Food Policy Research Institute. United States Environmental Protection Agency (USEPA). (2006). EPA Proposes Regulation for a Renewable Fuel Standard (RFS) Program for 2007 and Beyond. Available on line: http://www.epa.gov/OMS/renewablefuels/420f06060.pdf. a Effect of U.S. biofuels production on U.S. prices. b Effect of U.S. biofuels production on world prices. c International Food Policy Research Institute, world prices. d International Monetary Fund's global food commodity price index. Reprinted from Hasing, Zapata and Carpio (2009). Andrew Muhammad (muhammad@agecon.msstate.edu) is Assistant Professor, Department of Agricultural Economics, Mississippi State University, Mississippi State, Miss. Ellene Kebede (kebede@tuskegee.edu) is Associate Professor, Department of Agricultural and Environmental Sciences, Tuskegee University, Tuskegee, Ala.